Apple today announced that the iOS 12.1 update, which is currently being beta tested by developers and public beta testers, will include the new Unicode 11 emoji. Apple first promised new emoji were coming on World Emoji Day back in July, but the new characters were not included in the original iOS 12 update. 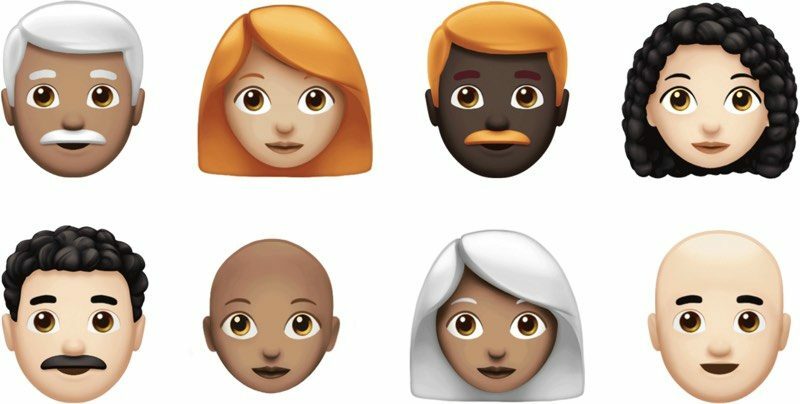 Apple plans to introduce more than 70 new emoji characters, with options for red hair, gray hair, curly hair, and no hair, along with smiley faces that include cold face, party face, pleading face, and face with hearts. Super heroes, an eye-shaped nazar amulet, and an infinity symbol will be added, along with new animals such as kangaroo, peacock, parrot, and lobster. New food items include mango, lettuce, cupcake, and moon cake, with a full list of new Unicode 11 emoji available from Emojipedia. Apple says that it is working with the Unicode Consortium to add additional disability-themed emoji to Unicode 12, which is set to be released in 2019. Developers can get the new emoji right now by downloading the iOS 12.1 update, and Apple says the software will also be available for public beta testers later in the day. So many emojis and still no search bar. I'm glad such a ground breaking new feature requires its own press release. Do you have any idea how long I’ve waited for a lobster emoji? I really don’t need new emojis. I want my battery life back. Simple. Hey guys, can you believe some people think Apple can only either fix bugs OR make new emojis?? Scary, I know, but some people just can't think logically.